Zurab Konstantinovich, the Russian Academy of Arts is celebrating its 260th anniversary with an impressively rich programme of events. Which of them would you single out? The Russian Academy of Arts is the natural successor of the Academy of Fine Arts and Sciences, which was founded in 1724 by Peter the Great; nevertheless, it should be noted that the Imperial Academy of Arts, as a separate entity, was established in 1757. As for this anniversary year, we are planning quite a number of extraordinary events to commemorate the Academy's 260th birthday, including exhibitions, conferences, masterclasses, and publications. One example is our major exhibition conceived as a chronicle of everything we have achieved over the last decade. All the Academy's branches, affiliates, research and educational programmes will be represented. This is our first interactive exhibition: the viewer will be able to see everything on screens, including extensive information on the Academy's work, the most up-to-date artistic trends and advanced technologies. 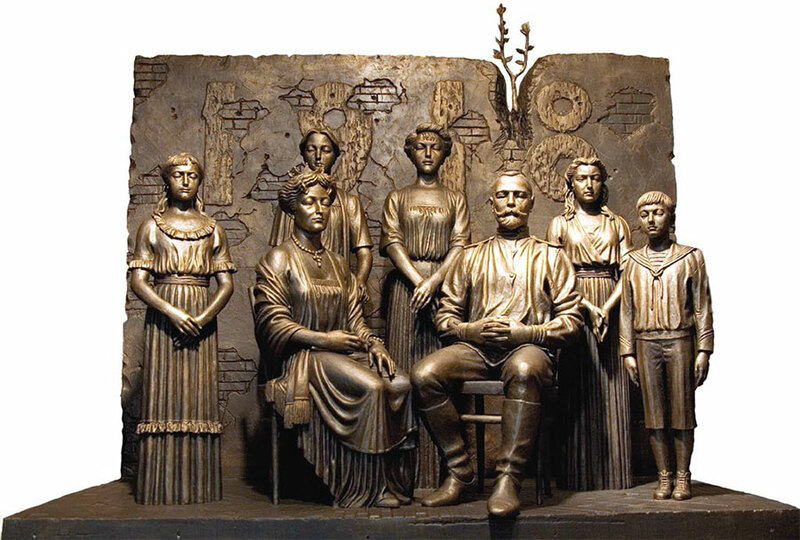 The Academy's regional branches will also be organizing exhibitions in Saratov and Krasnoyarsk; our traditional conference, the “Alpatov lectures", will be dedicated to the anniversary as well. As for the main anniversary celebrations, they will take place on September 19-21. The anniversary exhibition and the 2nd “World Culture as the Source of Sustainable Development" International Forum both open on September 19, with participants from various regions of Russia and abroad. The Forum's packed two-day schedule is built around its main theme, cultural diversity and cooperation as the path to bringing people together. On September 21, following tradition, our main event, the General Academic Assembly of all the Academy's full and honorary members and foreign guests, will be held. What is the difference between the honorary and foreign members of the Russian Academy of Arts? What role do they play in the work of the Academy? To understand why we elect foreign members, one should look back to the Academy's history. From the moment of its foundation, the Academy took on the task of establishing artistic education in Russia, developing the national fine arts, architecture and the study of art. In addition to that, the Academy became an international cultural centre that brought together many individuals who had distinguished themselves in the arts and sciences. 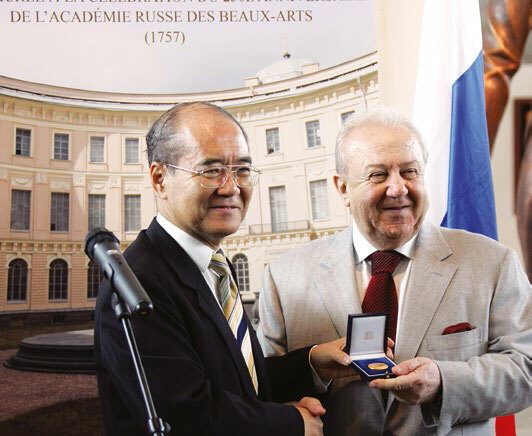 Since 1757, many outstanding artists, architects, writers, musicians and theatre professionals - both Russian and foreign - have contributed to the Academy as professors, Academicians, full and honorary members, and honorary associates. Just remember such names as Mikhail Lomonosov, Denis Diderot, £tienne Maurice Falconet, Carlo Rossi, Taras Shevchenko, Pavel Tretyakov, Dmitry Mendeleev, Adolf von Menzel, Auguste Rodin... In total, 190 distinguished figures representing the arts and sciences from 16 nations have been awarded honorary membership in the Academy. This tradition is very much alive today. 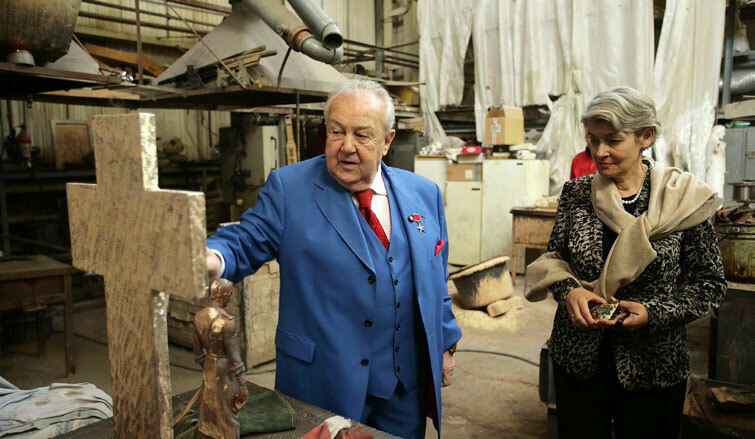 The list of our honorary members includes such truly outstanding individuals, from both Russia and abroad, as the rector of Moscow State University Viktor Sadovnichiy, Director-General of UNESCO Irina Bokova, Permanent Secretary of the Academie Franpaise Helene Carrere d'Encausse, Director of the National Art Museum of China the sculptor Wu Weishan, and the renowned designer Pierre Cardin. Today, our Academy welcomes scientists, medical professionals and cultural figures alike, among them the scientist Yury Osipov, the surgeon Leo Bokeria, the cosmonaut Alexei Leonov, the singer Iosif Kobzon, the film directors Stanislav Govorukhin, Nikita Mikhalkov, Georgy Danelia, Sergei Soloviev, the poets Andrei Dementiev and Ilya Resnik, and the writer Edvard Radzinsky. The list can be continued: the conductor Vladimir Fedoseev, the violist and conductor Yury Bashmet, as well as businessmen and philanthropists like Vitaly Machitski, the co-founder and general sponsor of the “Tretyakov Gallery" Magazine; the founder of the Kandinsky Prize, Shalva Breus; the founder of the Institute of Russian Realist Art Alexei Ananiev, and many others. There are many more whom I love and respect - and I have to apologize to those I have not named here: we would need a separate article to list all such figures. We are proud that these remarkable people are part of the Academy. 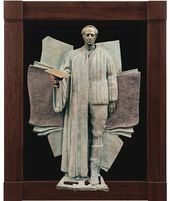 The unique fellowship where the arts, culture and the sciences come together is beneficial for the life of the Academy of Arts, and for its role in today's world. How would you describe the place that the Russian Academy of Arts occupies in contemporary culture? Throughout its existence - quite a long one now, almost 300 years - the Academy has experienced reforms and reorganization; it was abolished in 1918, and re-established in 1947, soon after the end of World War II. 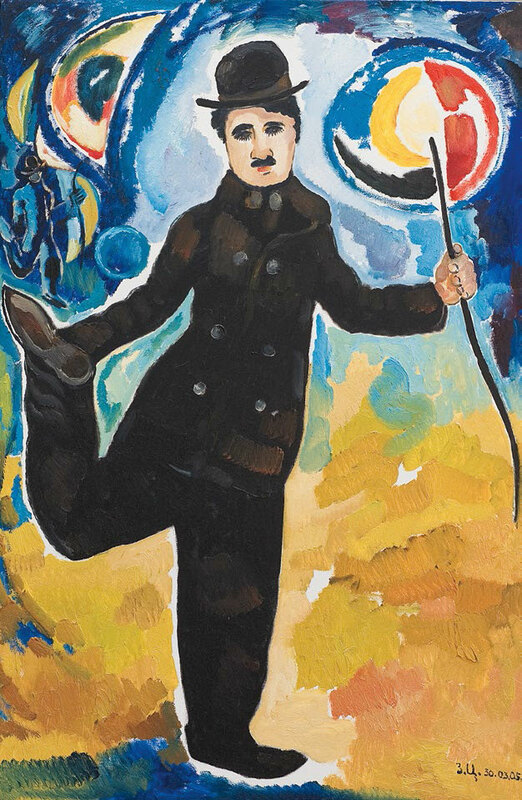 Today, as ever, the Academy plays an important role in our society, and continues to evolve as it pursues its mission to safeguard and develop Russian art, culture and the national identity. In recent years, the Academy has been engaged in fundamental scientific research that embraces the most current developments in the study of art. 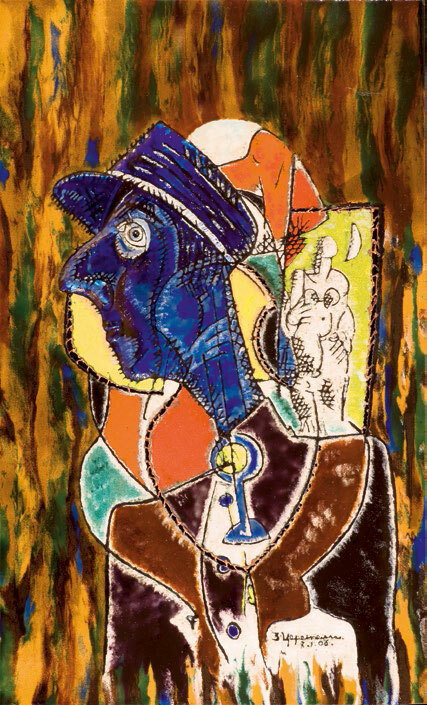 This programme is carried out by our various research, educational and museum entities, as well as our specialized departments of architecture, painting, sculpture, drawing, design, decorative arts, theatre and set design, art history and criticism, photography and multimedia, and cutting-edge trends in art. Professionals in all regions of the country, including Central and Southern Russia, the Volga Region, the Urals, Siberia and the Far East, are involved with this programme. It is imperative that all such subsidiaries work in cooperation, since real results in one area, be it art study, education or organizing exhibitions, are contingent on advances in other fields. The only way to grow at a national and international level is through such continued cooperation. As a matter of fact, we currently face many challenges. Personally, I am concerned about the declining levels of professionalism and craftsmanship. No wonder - so many art schools and colleges that used to train artists of all kinds, including sculptors and painters, have been closed. The Academy has expressed concern about this many times, only to hear in reply, “Is it worth recreating those schools if the younger generation does not seem to care?" 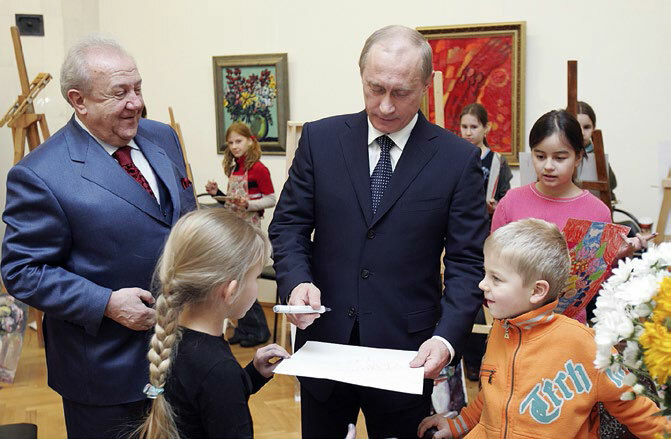 In fact, it was young people who asked President Putin at the Tavri- da meeting for help re-establishing art training institutions, and the President immediately gave instructions to do that. This is no easy task, but we are working on it; luckily, the decision was made at the highest level. This is a special year for you personally - you mark 20 years as the Academy’s president, during which time you have been unanimously re-elected many times. What is your assessment of the Academy’s work under your leadership, and what are your main challenges? Has it been 20 years? It is hard for me to believe it! I have always been bad at remembering numbers, like birthdays or telephone numbers. Joking aside, a lot has happened over these 20 years. When I was first elected in 1977, the situation was complicated, so I saw my first priority in strengthening the Academy by bringing together as many gifted people as was possible. We held new elections, and new, strong individuals joined the Academy's senior ranks. We had significant success: we renovated the premises and revitalized the Academy through partial reorganization. I always championed bringing young people in, but with due respect for the elders - there was a lot to learn from them, and I was set on preserving the tradition. Today, we continue to focus on ensuring cooperation between our experienced professionals and the younger generation of artists. I am pleased that we were able to establish new departments of photography and multimedia, two important contemporary artistic movements. Indeed, we do our best to keep up with the times. Here is the basis of my approach: all noteworthy and talented works of art, whether realist, contemporary or something else, deserve the Academy's consideration and professional review. 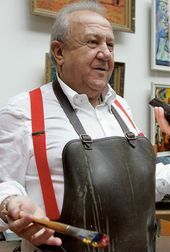 I created the Moscow Museum of Modern Art, the first of its kind in Russia, and contributed my private collection of Western and Russian art to it. Both established members of the Academy and pioneering contemporary artists exhibit their works at the museum - it is important to me that it represents the whole complex and diverse world of contemporary art, without enmity or conflict. Unfortunately, we have run into problems along the way - isn't that always the case? For example, there was a blanket reform of all state academies of sciences, which included us as well, since we are a state academy. I made it clear right away that we were different from the Russian Academy of Sciences, the Academy of Medical Sciences, and the Academy of Agriculture: those are scientific institutions that are engaged in fundamental scientific research, while our main goal is to create works of art - indeed, from our three departments, those of painting, sculpture and art study, only the third one carries out research. When we are told only to report our work in sciences, I point out that the visual arts require different norms and a different kind of reporting. Art is science, I can prove that to anyone, but it is a special kind of science that cannot endure formalism, considering that our most important job is creating works of art. Another challenge for us is the fact that over time, various colleges, vocational schools and even some research institutions were removed from under our authority; today, they are gradually being returned to us, because an Academy branch cannot exist without its research institutions, and vice versa - in that case, without professional cooperation, the very meaning of such institutions' existence is lost. If you come to a college as an invited guest, not as someone who actually works there, how are you supposed to contribute to the curriculum?! I do have to say here that we do not lose touch with higher educational institutions because members of the Academy are in charge of many workshops and departments there. 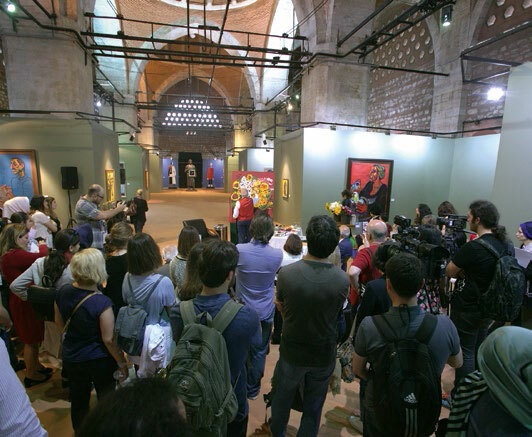 I am pleased that the Ministry of Culture has always supported and helped us as much as possible. The same is true regarding the State Duma, where Iosif Kobzon personally introduced legislature titled “On the Russian Academy of Arts". However, it seems that the time is not yet right. We hope that during this anniversary year some positive changes will take place in those difficult areas. International cooperation has always been one of the Academy’s priorities: as an institution, it was conceived to take the treasure trove of worldwide knowledge and cultivate it on Russian soil. What place does the Academy occupy in the modern world, and what is the significance of international ties for the Russian school of fine art? Internationally, the Russian Academy of Arts works to preserve and further develop the traditions of the academic school of the fine arts, advance the highest levels of professionalism, as well as promote our national art abroad. Over the period 2007-2017, the Academy organized exhibitions and conferences within the framework of the yearly “Crossroads of Culture" projects, including Russia-Italy, Russia-Spain, Russia-France, Russia-Germany, Russia-Great Britain, Russia-the Netherlands, and Russia-Greece. 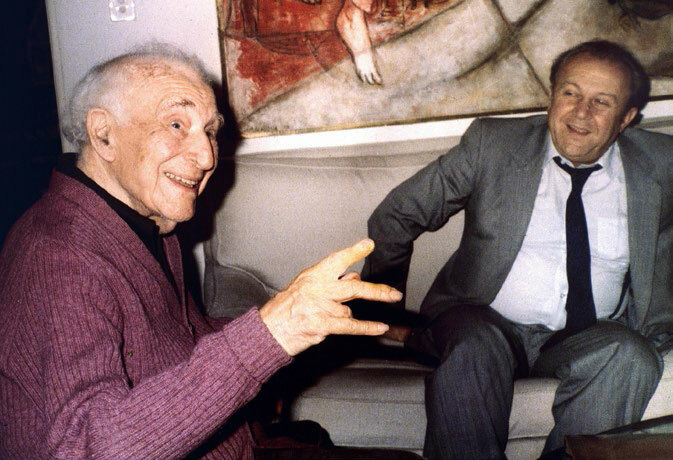 In that same time, the Academy awarded honorary memberships to outstanding cultural figures, scientists and artists from Italy, France, Spain, Germany, Macedonia, Liechtenstein, USA, Israel, China, Japan, Azerbaijan, Uzbekistan, Kazakhstan, Armenia, Belarus, and other countries. We continue holding cross-cultural masterclasses, lectures and seminars. It is important to understand that we don't just travel ourselves, but always welcome artists from other countries. Every month, several exhibitions open in the Academy's halls, and both our own members and guests from abroad show their work at the same time. You are a UNESCO Goodwill Ambassador, and one of the most active ones, according to UNESCO and the Russian Ministry of Foreign Affairs; your outstanding contributions to UNESCO earned you the organization’s highest award, the “Five Continents Medal”. What are your favourite aspects of your work for UNESCO? In which programmes do you participate? I see this work as a continuation of the Academy's international involvement, since we have worked in cooperation with UNESCO for a long time. 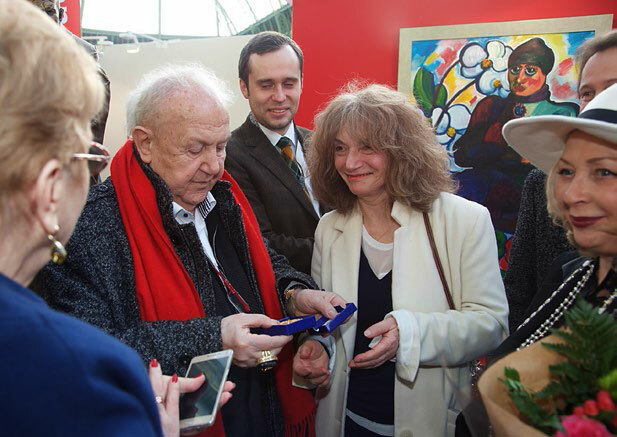 As soon as I became a UNESCO Goodwill Ambassador, I proposed that the works of graduates from our Academy's two art colleges (in Moscow and St. Petersburg) be shown at UNESCO's headquarters in Paris. Everyone marvelled at their level of professionalism and the quality of their training, the school of art that we were able to preserve. In 1997, with the support of UNESCO's Director-General Federico Mayor, UNESCO's International Department of Fine Art and Architecture was established as part of the Academy's structure. The department offers educational and research programmes in compliance with UNESCO's current requirements. 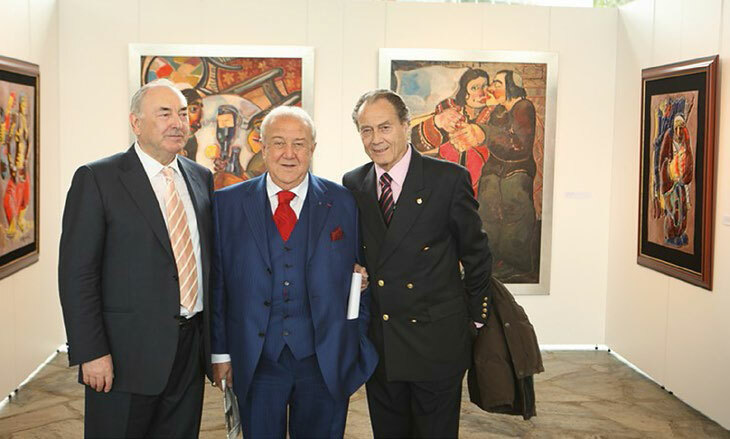 Many of the exhibitions and conferences organized by the Academy have taken place at the UNESCO headquarters, under the organization's patronage, and with the participation of its executives. All parts of the world are represented at UNESCO, and it is easy for everyone to learn what the Russian Academy of Arts is, and what direction the Russian school of art is taking today. The way I see it, as a UNESCO Goodwill Ambassador, my main goal is preserving and growing the unique Russian school of art. You have done a good deal of work yourself recently, both in Russia and abroad. Which projects stand out, which have been the most important and exciting for you personally? 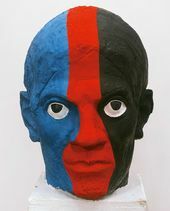 I treat all my sculptures in the same way as I treat real people - I do not want to hurt anyone by leaving any one out. More than that, I treat them as if they were my children: I cannot single any of them out - I gave birth to them all, I created them. The passage of time does make a difference, one begins to analyze things, and yet I never divide my works into those that are more important and those that are less so. Whether it is a memorial plaque on a building or a large-scale monument, the responsibility is the same. 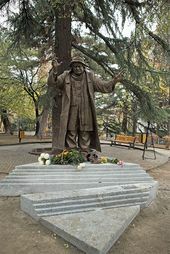 Indeed, I have worked on many things in the decade since 2007, which marked the Academy's previous major anniversary: the memorial to the Beslan victims of terrorism (2010), in front of the Alansky Metochion in Moscow; the monument to Pyotr Stolypin (2013) in Ulyanovsk; the monument to Zoya Kosmodemyanskaya (2013) in Ruza; the memorial to the Cossacks (2015) in Krasnodar; and the memorial to the people's volunteer militia, or rather to the fighters of the 7th Bauman Volunteer Division (2015) in Moscow. There have also been sculptural busts of Russian Princes, Tsars and Emperors, in the courtyard of the Russian Military Historical Society. I love history - all of those monuments are dedicated to our history. When I was a young man, right after I graduated from college, I was lucky to get a job with the Institute of Archaeology and Ethnography at the Academy of Sciences [of the Republic] of Georgia. I worked on registering measurements, drew sketches, and took part in expeditions, so historical compositions and images of outstanding historical figures are naturally at the centre of my work. 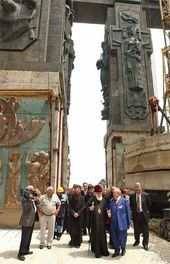 Last year Andrei Dementiev and I unveiled a monument to the Soviet poets of the 1960s, the so-called shestidesyatniki, in the town of Tver. 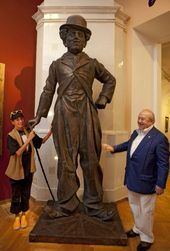 Dementiev is a native of Tver, so it was there that he established a museum of poetry, the only one in Russia. 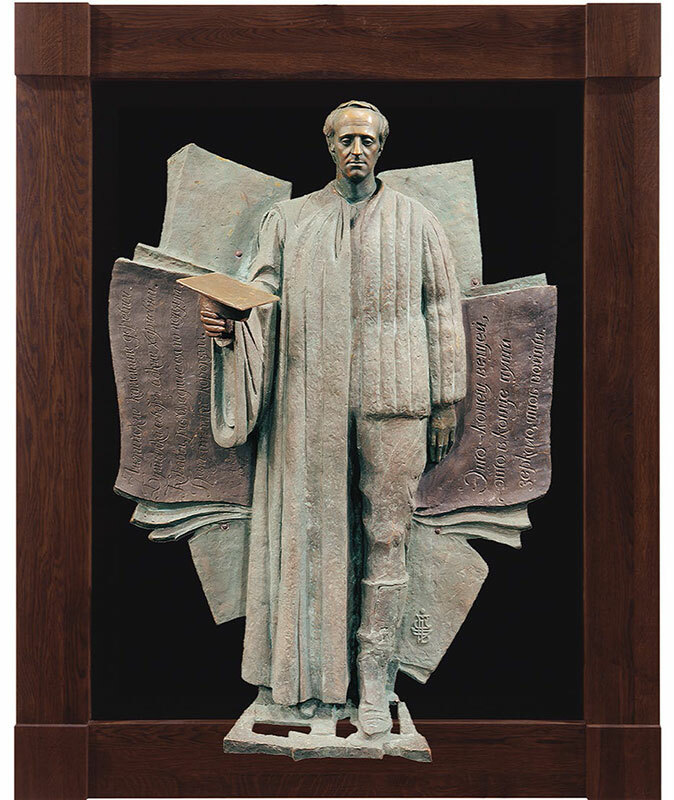 Andrei asked me to think about creating a monument to the poets of the 1960s, and I came up with a slightly unorthodox composition: a black frame with books in it, with the names of famous poets printed on them. I am so glad that both the citizens of Tver and those who visit it like my work. What about the works created for locations abroad? 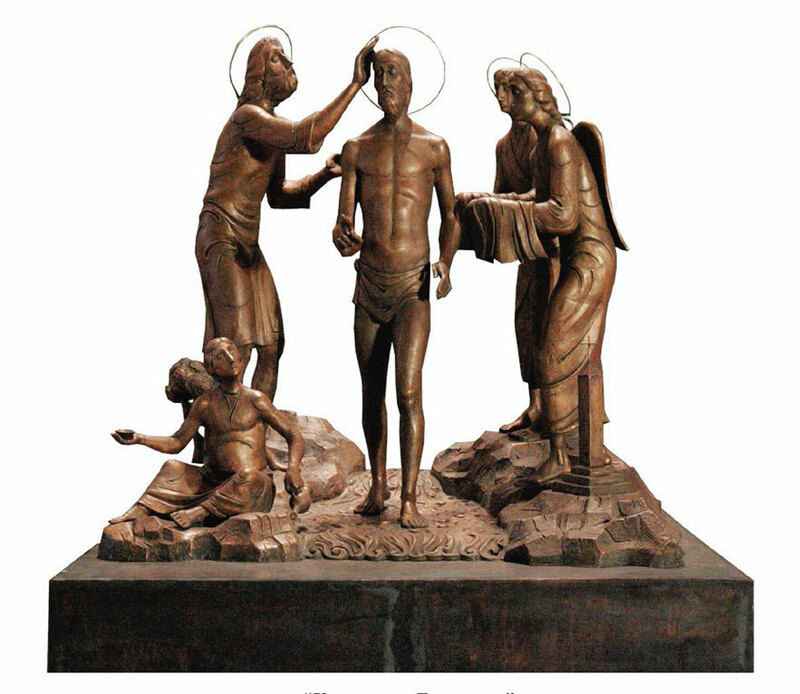 Well, I would mention the sculpture of St. Paul (2013) in the Greek city of Veria - that was unveiled by Patriarch Kirill of Moscow. 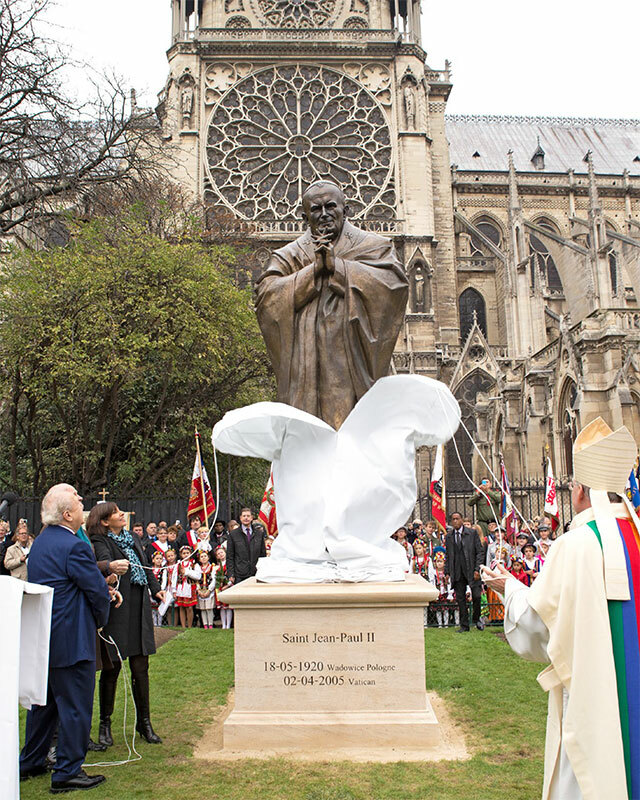 Another is the monument to Pope John- Paul II (2014) in Paris; the Polish Catholic Mission in Paris wanted to put it next to their church, but City Hall offered several spots next to Notre-Dame Cathedral. Had someone told me this would happen, I would never have believed it! Now the monument stands in a wonderful spot next to the cathedral, facing the Seine, on truly sacred ground. 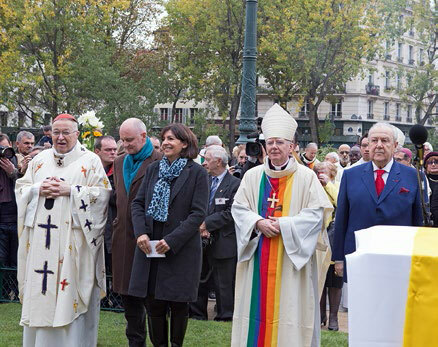 It was a great honour - both the Mayor of Paris and the UNESCO Director-General attended the unveiling. I also welcome every opportunity to create monuments for my native Georgia. 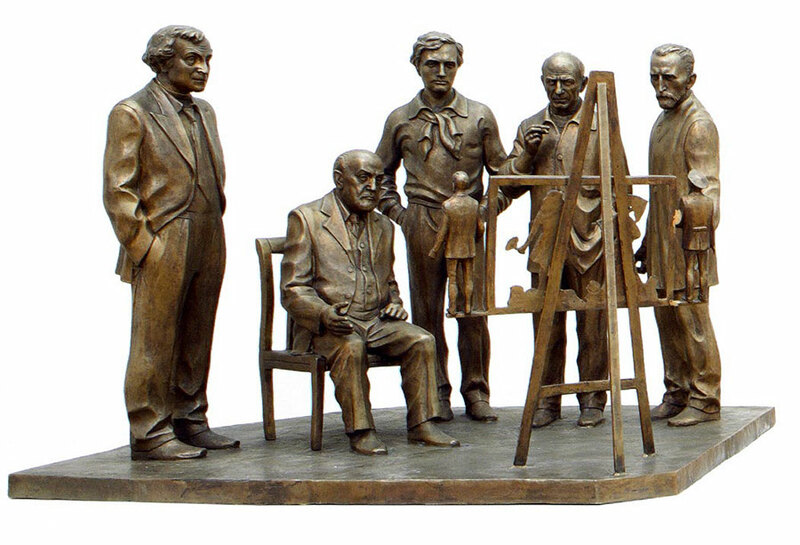 My sculptural composition “Mimino" (Tbilisi, 2011) is dedicated to friendship - I chose [the director of the film “Mimino" and the actors who star in it] Danelia, Leonov, Mkrtychan and Kikabidze as my models. 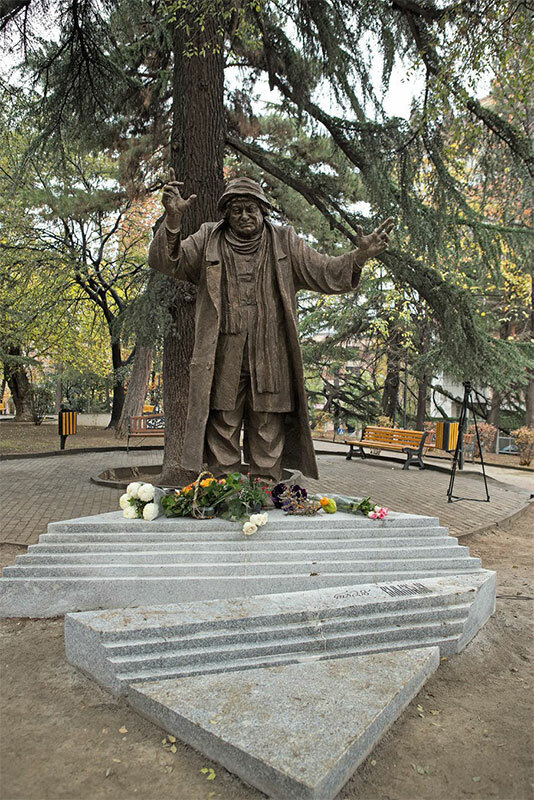 I would also like to mention my monument to Nino Ramishvili and Iliko Sukhishvili (Tbilisi, 2011.) I am now concluding decades of work on my composition “History of Georgia", soon to be opened by the Tbilisi reservoir. I created “Musketeers" (2010) for the town of Condom in Gascony, the site of a unique cathedral that dates back to, I think, the 13th century. Once a year, the town hosts members of the French Musketeers Society, who came up with the idea of a sculptural monument. I thought of our remarkable actors Boyarsky, Smekhov, Smirnitsky and Starygin, who played musketeers in the famous Soviet film. Smekhov and Smirnitsky attended the unveiling of the composition, and were immediately accepted into the French Musketeers Society! Once again, friendships were forged through art. You know, culture does unite nations and enrich their understanding of one another. Art brings people closer together. 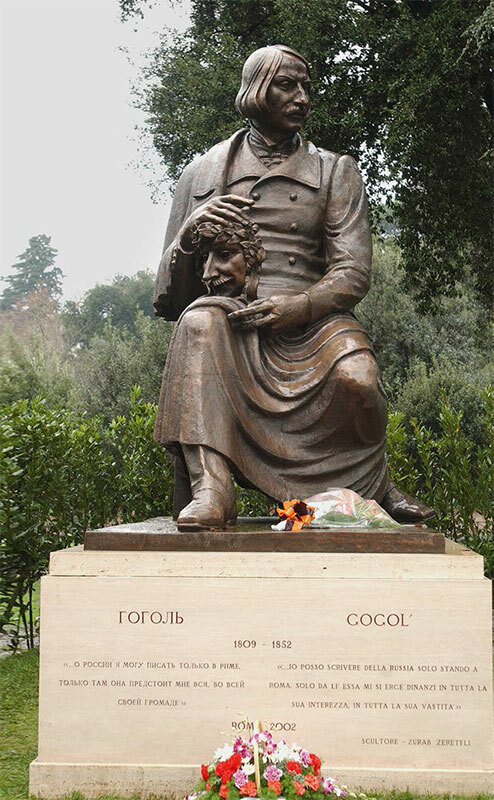 My old friend Armando Ginesi asked me to create a sculptural composition for Morciano di Romagna, a small Italian town near Rimini that is the birthplace of the renowned Italian sculptor, Umberto Boccioni. 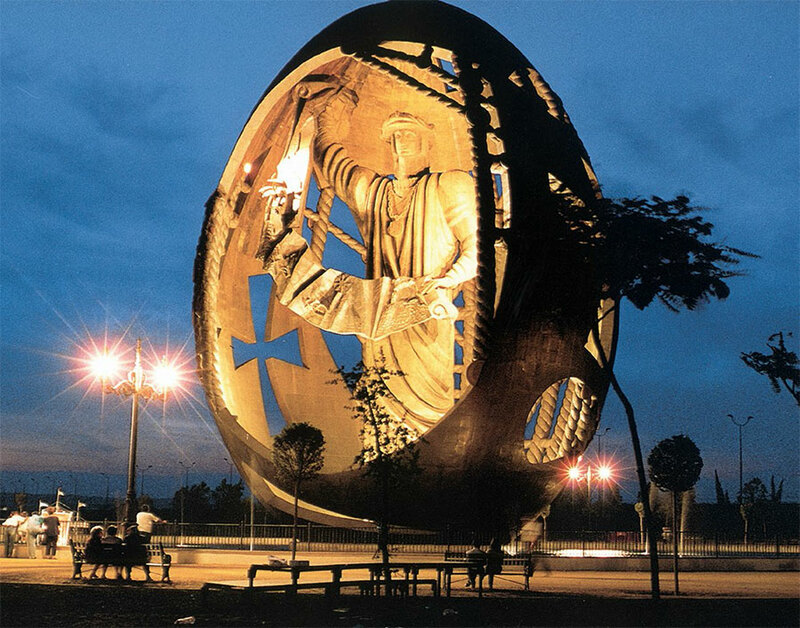 Ginesi's vision was that Arnaldo Pomodoro fashion one town square, and I work on the other. I came up with the idea to create a sculpture that would include clowns - after all, the great Fellini was born in Rimini, hence the free nature of the composition. It was a very interesting project. 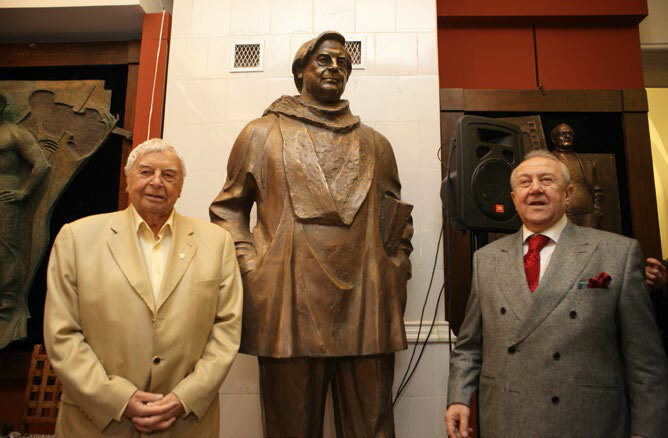 Zurab Konstantinovich, what is the status of your ambitious Christopher Columbus monument? Has it found its home yet? It would be more appropriate to call this project “How Europe Discovered America". I worked on it for almost 30 years and dedicated it to the 500th anniversary of Christopher Columbus's legendary voyage and discovery of the American continent. 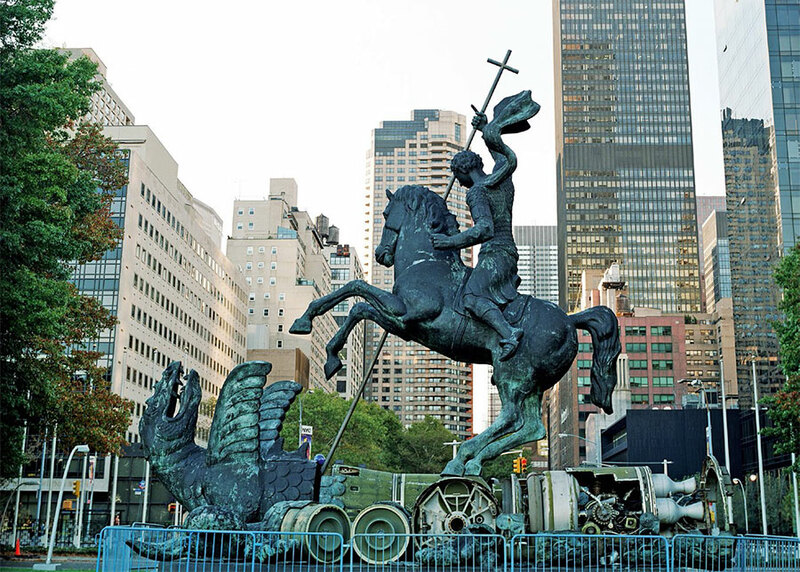 In 1989 the decision was made to create two monuments and place one of them in Spain, the other in America. 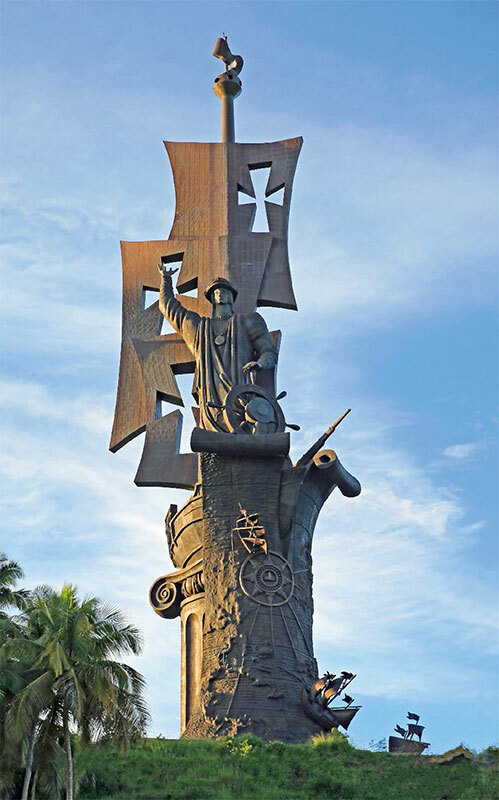 I won the international competition, and in 1995 the first monument I created, the 45-meter composition “The Birth of a New Man", was unveiled in the harbour of Seville, from where Columbus started his voyage. The UNESCO World Commission on Culture and Development declared it the best work of sculpture of the 20th century. I also installed a smaller version at the UNESCO headquarters in Paris. 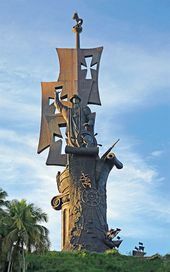 The second monument, my 126-meter sculptural composition “The Birth of a New World", was assembled in Puerto Rico in 2016. You have had numerous solo exhibitions both in Russia and abroad. Are viewers different? What about the reviews? In general, for you as an artist, what is the difference between showing your work in Moscow or, say, Perm? I have shown my works all over Russia - of course, there are some regions I have not had the chance to visit, but I have been to the Urals, Siberia, the Volga Region, the Northern Caucasus, and Southern Russia, from Krasnodar to Krasnoyarsk! These exhibitions offer me a unique opportunity to present my work both to fellow artists and to the general public. Almost everywhere I went, I received requests to conduct a masterclass. It is really hard to make comparisons, but I would say that people in the regions far from the capital are wonderfully kind and amicable. I always feel that when I meet people, even in press conferences. Such meetings are very important to me - kindness and support are invaluable; the viewers' feedback is vital to any artist. Among other things, I am still the president of the Russian Academy of Arts, so I see exhibitions as a way to “report" to my fellow artists, a way to show them what I have been working on. Thus, the reviews from my colleagues and other professionals are very important to me. During the last 10 years I have also had several solo shows abroad, namely in Italy, France, Turkey, China and Switzerland. I had some important meetings and met many interesting people on those trips, which have provided great opportunities for international cooperation. It makes me very happy to know that people both in Russia and abroad embrace my work and show interest in what I do. This may be the single most important thing for me - it gives me the energy to go on working. First part of the project “How Europe Discovered America”, dedicated to the 500th anniversary of the historical voyage of Christopher Columbus to the American continent. You give a masterclass almost every week. How would you define this practice? What do you gain from it, and what can the attendees expect from your masterclasses? It gives me great joy to be doing what I love, while at the same time providing others with an opportunity to see it from within. We have a very diverse audience that includes children, young people and older adults; quite often it becomes obvious that these are not professional artists but just people who are simply curious. I am frequently asked why I spend my time on people who may only come once or twice, but I have a special take on those who attend my masterclasses: if it gives them joy to come into contact with art, I have fulfilled my mission. I believe that the atmosphere in the class should be open, allowing people to relax and get a feeling of what painting is about. We have free supplies - small canvases, brushes and paints - so that everyone can try their hand at making art. Unsurprisingly, teaching painting to children is incredibly uplifting - I think I get more positive energy from them than they do from me. I have always said that Picasso and Matisse would both be jealous if they saw those children's drawings - it is wonderful to see how they capture form, choose and mix colours. This kind of freedom can only be found in the pure, unguarded soul of a child. We adults are too tense, unable to let our imagination go. I don't really give any assignments at my masterclasses. First I like to see who is attending: if there are people with some professional training, like art school or college, giving an assignment and offering professional advice makes sense. If the group is quite diverse, both in age and training, or there are some small children present, I say, “Follow your imagination!" and make sure I paint, too, so that my students may come up to me, watch and ask questions. At the end of the class I come up to them to see their work. You put forward a proposal to create an art therapy programme at the Russian Academy of Arts. Several conferences and seminars have already taken place, and some research materials have been published. You personally offer customized masterclasses. In your opinion, what does art therapy have to offer, and what are its possibilities, realistically speaking? You know, it is clear that art can heal. Art has a different effect on different people, including those in poor health, but one thing is certain: it has a powerful energy. 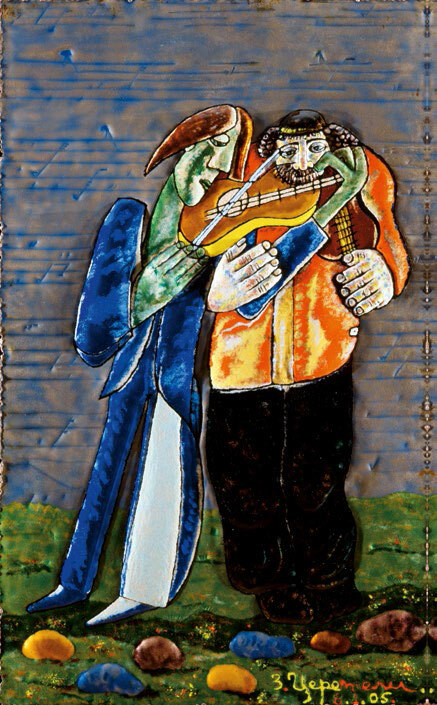 There are examples of the very positive effect that art has on people, which can mean healing. I first heard about art therapy when I was in the United States - in 1978-1979, I was invited to teach at the College at Brockport, State University of New York, at the Department of Fine Arts. 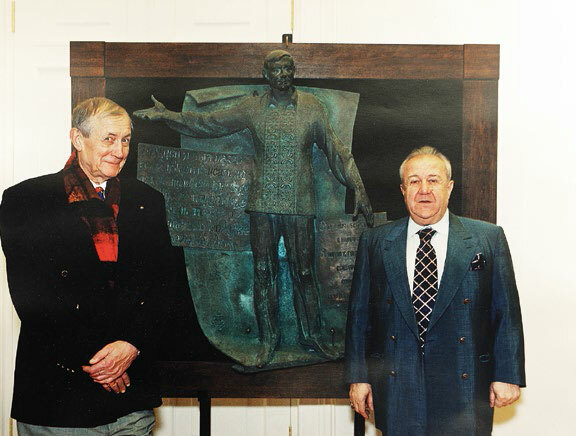 It was there that I created my first sculptures; one of them, “Prometheus", I presented to the college, and another one became a gift to the USA from the Soviet Union. The composition, called “Happiness to All Children in the World", was dedicated to the first Special Olympics for children with disabilities. These Special Olympics were organized by the Kennedy Shriver Foundation. The theme of my composition was relevant to its purpose - the limitless capabilities of human beings. Most importantly, I saw people missing legs and arms doing sports - they were so free, so at ease, enjoying life to the fullest. It made a profound impression on me. As I worked on my composition, I sought artistic solutions in iconic images and abstract form; I also took part in special masterclasses and training. Back then, I thought we should do the same at home. It made people so happy! Today, there is scientific proof of the benefits that art therapy offers, so we started a new research programme at the Academy called “Art. Science. Medicine" and have organized thought-provoking conferences. Today scientists, doctors and artists work together for a common goal. We are determined to continue with this work. The crossroads of art and religion is an important subject for the Academy. Following the reconstruction of the Cathedral of Christ the Saviour in Moscow, which was carried out by members of the Academy, what other similar projects would you single out? 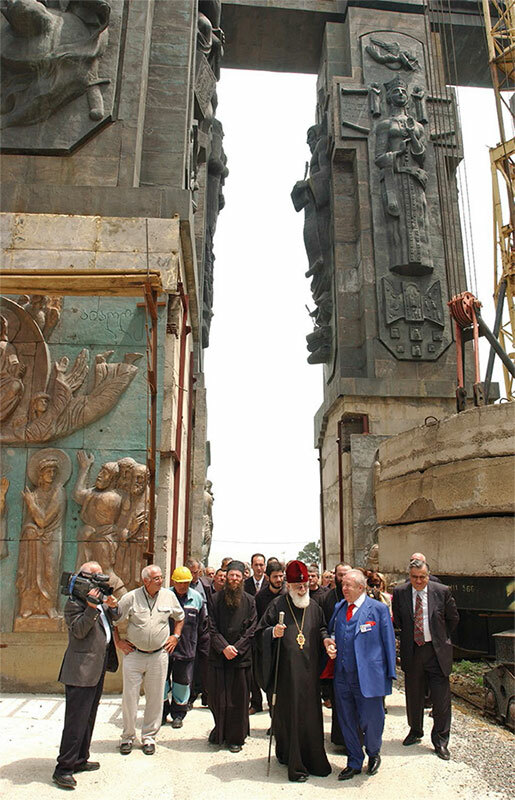 The reconstruction of the Cathedral of Christ the Saviour was a milestone. In point of fact, all the outstanding artist-members of the Academy came together and showed what they were capable of. Our main challenge was that a lot of work had to be completed in a very short period of time. Bear in mind that it took decades to build and decorate the cathedral in the 19th century, while we finished its reconstruction within two years, to mark the second millennium of the anniversary of the birth of Christ. Truly, all of us held this project very close to our hearts. The Academy is often involved in many projects in Russia and abroad, painting and laying mosaics in various cathedrals. Thus, today the Russian Academy of Arts and its members are working on the interior mosaics of the Church of St. Sava in Belgrade. The scope of work there is enormous: the church is considered to be the largest Orthodox cathedral in Europe. 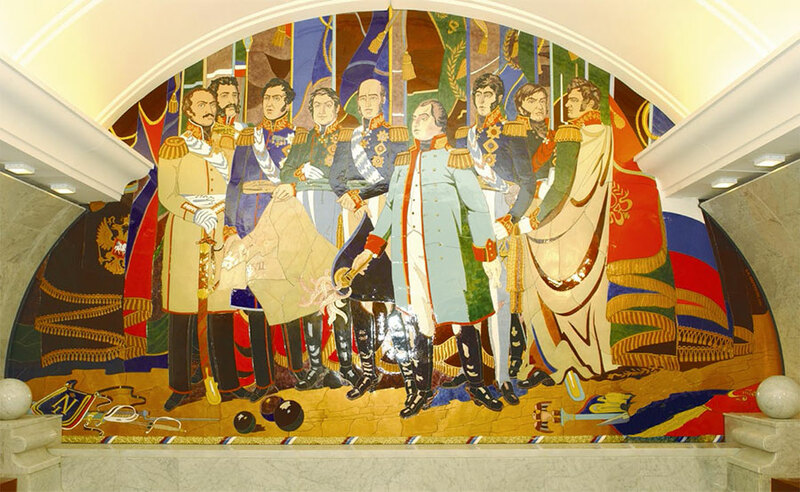 Russian artists have created mosaics for the cathedral interior as part of a special international cooperation initiative: this work is Russia's official state gift to Serbia. In fact, the Academy is fulfilling the Russian President's mandate. Please tell our readers about a particular Academy project of your choice. What would you suggest that they should see? I think that I would like to invite them to the new artist's workshop museum in Peredelkino. I think we have created a very interesting space there, with sculptures outside that look like they are growing with the trees. Once upon a time, in the days of the Soviet Union, this small house, a dacha with two artist's studios, was built for the French artist Fernand Leger and his wife, Nadya. As far as I know, Fernand visited only once. I knew his wife Nadya very well. A gifted mosaics artist in her own right, she liked my work, and wanted to give me the dacha as a gift. After her death, the family wanted to sell the house, and I had the opportunity to buy it, even though I was not sure how I would use it - I worked in my studio in Moscow and often visited Tbilisi. Now I spend a lot of time in Peredelkino - I feel that there is a special creative energy there... When I am there, I work and write. Here is what I noticed: all the time people would knock on the door, asking if this was a museum, and whether they could come in and see it. So I decided to go ahead and open the house to the public. I have recently finished installing everything I wanted there in the garden; I think everything is finally the way I wanted it, but the project is a work in progress - it reflects the atmosphere of an artist's studio, with things changing, moving and being finished. It gives me pleasure to know that after visiting the museums in the village dedicated to Bulat Okudzhava, Yevgeny Yevtushenko and Boris Pasternak, they come here. Of course, visitors can see portraits of these great people in my house, too. Zurab Konstantinovich, don’t such visitors interfere with your work, distract you from it? Never! People approach me during my masterclasses, too, they ask me questions, and chat. It is a little bit of a distraction, but I love people - I work for them. So I am happy that they are interested in my art. People come with their entire families, with their children, especially at the weekends - isn't it wonderful? I decided that after the official celebration of the Academy's 260th anniversary I would invite everyone to Peredelkino. There will be many artists from all over Russia. I decided that I would say, “Let us go and celebrate there!" The most important thing is that we will have good weather!